The rainbow-emblazoned MVPBS van and white dog are often present at Island events. 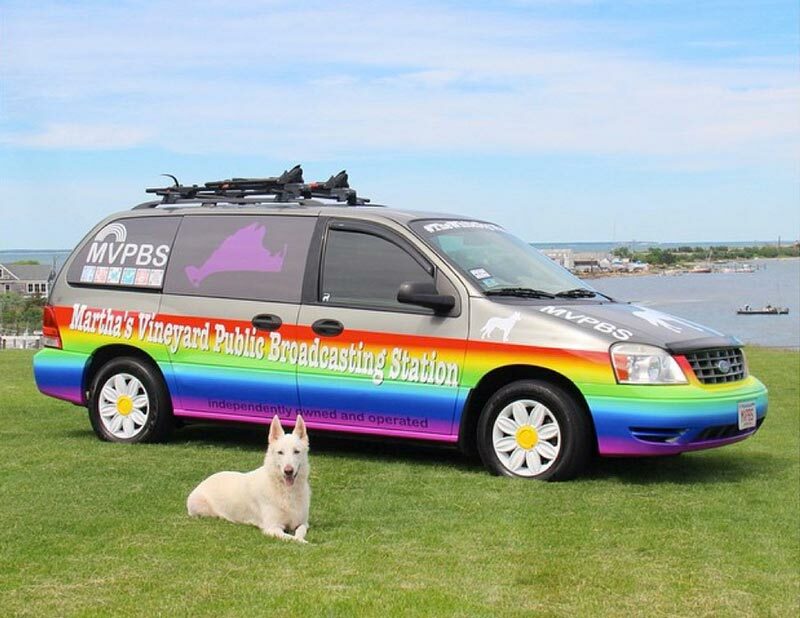 Daniel J. Adams of Vineyard Haven drives a colorful rainbow-striped van emblazoned with “Martha’s Vineyard Public Broadcasting Station” (MVPBS) on the side, and an image of “the White Dog,” his company logo. Some days, Mr. Adams, MVPBS president, can be seen walking along the sidewalks of Vineyard Haven, his dog and mascot by his side. Although MVPBS claims to be a nonprofit organization, accredited by the Better Business Bureau (BBB), with an FM radio station “coming soon,” The Times was unable to verify any of those claims. Several people familiar with Mr. Adams through their business dealings described a pattern of inconsistencies, misrepresentations, and advertising purchased but not delivered. Even to a casual observer, the immediate assumption is that Mr. Adams is somehow connected to the well-known Public Broadcasting System, or one of two nonprofit radio stations that broadcast to the Island. In frequently asked questions section of his website, Mr. Adams answers the question, Is MVPBS a PBS affiliate? MVPBS Inc. registered as a nonprofit with the Massachusetts Secretary of State in March 2014, according to filed documents. Although MVPBS states it is a nonprofit, a spokesperson at the Massachusetts Secretary of State’s office said that MVPBS Inc. is not listed as a 501(c)(3) corporation. Neither MVPBS Inc. nor Martha’s Vineyard Public Broadcasting Station could be found on the Internal Revenue Service (IRS) website that lists nonprofits, or on Guidestar, a website with a database of 2.2 million IRS-recognized nonprofits. In fact, Mr. Adams’ application has been rejected twice. In a three-page letter dated Sept. 29, 2014, Peter H. Doyle, chief of the audio division at the Federal Communications Commission, rejected, for a second time, the MVPBS application for a Low Power FM radio station (LPFM). “Although the [application] states that MVPBS has operated as a ‘not-for-profit, educational resource entity’ since January of 2010, it does not state that MVPBS had any legal recognition under the laws of Massachusetts or clarify what type of entity MVPBS may have been prior to its March 2014 incorporation as MVPBS, Inc.,” Mr. Doyle wrote. Mr. Adams has also made liberal use of the Better Business Bureau (BBB) logo on the MVPBS website and other social media. Matt Stamas, musician and administrative assistant in the Oak Bluffs tax collector’s office, said Mr. Adams used his name on an application to the FCC without his permission, and that he subsequently ended up in a legal battle with Mr. Adams. Mr. Stamas was referring to a Facebook page, “Scam Alert: MVPBS,” that has attracted a steady stream of comments from MVPBS detractors. Mr. Stamas said Mr. Adams has a history of confrontational behavior. Several people who spoke to The Times critically about Mr. Adams would not speak on the record for fear of retribution, they said. Tim Hanjian, owner of Eco Island Pest Control in Oak Bluffs, had no such reservations. Mr. Adams did not return calls or emails from The Times. However, an administrator with the company, who spoke off the record and asked not to be identified, called to say that MVPBS is in fact a BBB member and that the company belongs to “a number of business organizations, including the Martha’s Vineyard Chamber of Commerce.” She also said that the “Scam Alert: MVPBS” Facebook page is the result of one business owner seeking revenge against Mr. Adams. “She’s someone with an axe to grind. I’ve even offered to meet her,” the administrator said. The originator of the “Scam Alert: MVPBS” Facebook page, reached via Facebook message, would not identify himself or herself, or speak on the record with The Times. Correction July 2, 11:21 am – in an earlier version of this article Stephen Warriner was incorrectly quoted that MVTV does not have sponsored content. MVTV does allow for sponsorships that would be similar in style to PBS, but does not allow advertising. Mr. Adams has submitted content to MVTV but did not broadcast Sharks games.